Goa is the heaven of holidaymakers and ultimate beach destination of India. The splendid beaches of Goa are divided into Beaches of North Goa and beaches of South Goa. These beaches around eighty three km in length are spread on nearly one hundred twenty five km of coastal region. 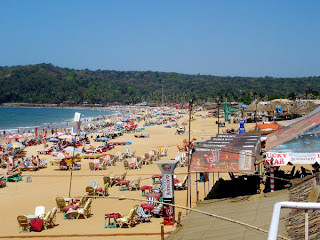 They are the main attraction of Goa tourism. The many beaches of Goa offer everything from exotic sea food, luxury resorts to unique experience of beach huts. Beaches of North Goa like Anjuna, Arambol, Baga, Calangute, Candolim and Dona Paula are full of happenings. While South Goa beaches like Agonda, Benaulim, Betul, Bagmalo, Colva, Majorda, Palolem and Varca are mostly providing serene atmosphere. Among these beaches Goa Baga beach is one of the most popular beaches of North Goa. Here you can enjoy everything from amazing water sports to vibrating night life. You can dine in one of the many restaurants of Baga and savor great taste of Goan cuisine. This beach is located at just nine km from Mapusa and sixteen km from Panaji. You can reach Baga by getting down at Thivim railway station. Also you can travel by air, Baga is just fifty km from Dabolim airport. 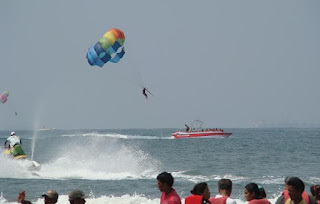 The various water sports which you can enjoy here are Para sailing, windsurfing, wake boarding and kite surfing. Otherwise prefer sunbathing by lying on the sands and munching chunky food accompanied with silent sips of beer. Apart from the best hotels near the beach the beach shacks are the best means to get sumptuous Goan food. Enjoy the fun of shopping by visiting flea market of Anjuna and night market of Arpora. After the day fun on the sands get refreshed and be ready for exotic nightlife of this beach. Discover one of the perfect night life venues at Tito’s lane for a deserving night life filled with entertainment and cheers. The open air bars regularly host events with dashing Dj’s. Visit Baga beach in Goa for an exciting beach experience of Goa.